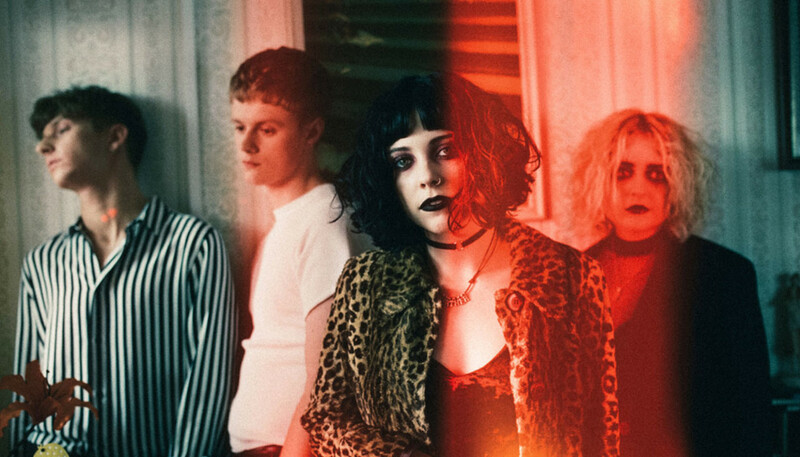 Hotly tipped as ones to watch, Pale Waves made the prestigious BBC Sound of 2018 list at the start of the year. Ever since the band - formed by university friends Heather Baron-Gracie and Ciara Doran - have been touring non-stop, and working on their debut album. 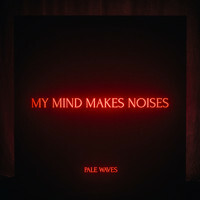 My Mind Makes Noises is finally here, so we had a quick phone call with Heather to find out more. You guys met at uni. You've described your relationship with Ciara as being like meeting your "soulmate" - can you tell us how that dynamic manifests when in a band together? Me and Ciara, we're very similar but very different at the same time. But our passion for music is the biggest thing ever - we love music, and that's how our friendship evolved. Because we would stay up late and just listen to music constantly! I feel like that's the reason Pale Waves is so strong - because our friendship is one of the strongest and closest friendships that I've ever had. Or will ever have. What music were you listening to when you stayed up? Ciara would just pull her laptop out and basically wade through all of her iTunes. So it would go from, like, Lucy Rose, to The Cure, to Miley Cyrus. Just all sorts! I put everything into this album, so you'll probably know everything about me. We read a piece likening you to a goth version of Taylor Swift. It's not something we would have initially thought about, but actually it makes sense. How do you feel about the comparison? I love Taylor Swift! She's one of my favourite artists, so it's a compliment. She writes amazing, massive pop songs - so to even remotely be compared to her is a huge compliment. I think a lot of people would be like, 'Noooo, why have they compared me to Taylor Swift! ', but she is probably one of the biggest artists right now. There's something about how her music really speaks to young girls - which is kind of what you guys do as well. To talk about the album a bit, can you maybe unpack the name for us - My Mind Makes Noises? We thought about album names for a good while, and then the song 'Noise' is one of the most important songs that we have, and I think we'll ever have, because it speaks to young people so much - not even young people. It speaks to everyone - loads of people are insecure about things. And this album is basically just about me, and what goes on in my mind - so I feel like that lyric does a really great job of summarising the album. Because that's just what it is - it's 14 tracks about me. Is that a bit scary? (Laughs) Yeah, it's pretty terrifying to be honest. But a lot of the time I just don't think about it - that I'm basically putting out to the world everything I feel and all my experiences. I feel like everyone's gonna know me. It must be surreal having people relating to those personal things you've put out there? Or is it nice? Yeah it's really nice because it makes it feel worth it - that whole uncomfortable stage you might feel in sharing something, it makes it feel worthwhile. Being in a band - particularly in the stage that you're at - the touring schedule and everything must be quite exhausting. Yeah, I mean it is - I feel like my body's got used to not needing that much sleep anymore. But it's good that we're really busy - I would rather be really busy than not busy. But sometimes it is definitely exhausting. We read that you're really into photography - how much input do you have into your videos and creative direction? Obviously you play quite a prominent role in them. It's my ideas - yeah, I control the videos a lot, and come up with all that. Just because I love visuals, and I love sitting down with a song and picturing the video for it - it makes me really excited. I love creating them, because I'm excited for the fans to see what I see. Is there any particular significance to the artwork for the album? I feel like red and black is an aesthetic that really represents our band. Not sure why, but we always come back to the colours - we have a track called 'Red' and a track called 'Black', but we didn't do that on purpose. It just happened. We wanted the black square, and the simplicity of that, but we wanted to create something physical too. We wanted to keep the artwork simple, because I don't like things that are over-complicated. Red and black is also such an emo thing - My Chemical Romance, Emily The Strange, Princess Nokia. I feel like maybe they're just the emo colours (laughs). Yeah I love all that music, all sorts of pop punk as well. My fashion sense is very dark and gothic too. Are people surprised when you dress in a certain way but your music isn't really like that? Oh yeah, all the time. People get shocked, especially if they've never heard of us and they'll look at our image and find it so hard to connect it. And like, it's really not that difficult - it's just fashion! Is there anything different on the album from what you've done before? There's an acoustic track on there which is just me and my guitar. That's completely different for us - people have never heard us like that. It's gonna be something special, because people wouldn't expect us to do that. There's a lot of talk about how younger people aren't so interested in the album as a format in an era of playlisting and all. What do you think? I think going to actually buy a physical copy is very special. I will definitely go and buy a physical copy of my own album (laughs). It will be surreal walking into a shop and being like "wow, there it is! What's going on!?". What's the first album that you bought? It was definitely an Avril Lavigne album. I love her - I think it was Let Go. Let Go and Under My Skin are two of my favourite albums of all time. But you've never been tempted to go for the t-shirt and tie look? We will look forward to it. Your music kind of reminds us of a film soundtrack - you can imagine it being part of an old school high school romcom. I mean, sometimes me and Ciara write to movies. Like we just have them on in the background, because the aesthetic puts you in a nice place. You're not even really paying attention to the movie, but in a way you are. We would like to think that any of our songs could go in a movie - a John Hughes movie. Is there anything you want people to know before they listen to the album? I put everything into this album, so you'll probably know everything about me. I'd like them to listen from start to finish, track by track. There's a reason I've put the songs in that order - I feel like it's a story, and it'll make more sense to the listener that way.